The Pacific Northwest is a beautiful place to visit during the summer and what better reason to come to Portland in August than by celebrating our 30th Anniversary with us. Below is a list of planned activities and events to toast to over 30 years of extraordinary work by Bridge City and its founder, John Economaki. The exhibition “Quality is Contagious: John Economaki and Bridge City Tool Works” will be launched at the Museum of Contemporary Craft. A reception will be held from 6pm to 8 pm on the roof of the building. A selection of plated and passed appetizers, appropriate to the season, will be served in addition to wine and non-alcoholic beverages. The exhibition runs through January 18, 2014. Please RSVP to members@MuseumofContemporaryCraft.org by August 8. 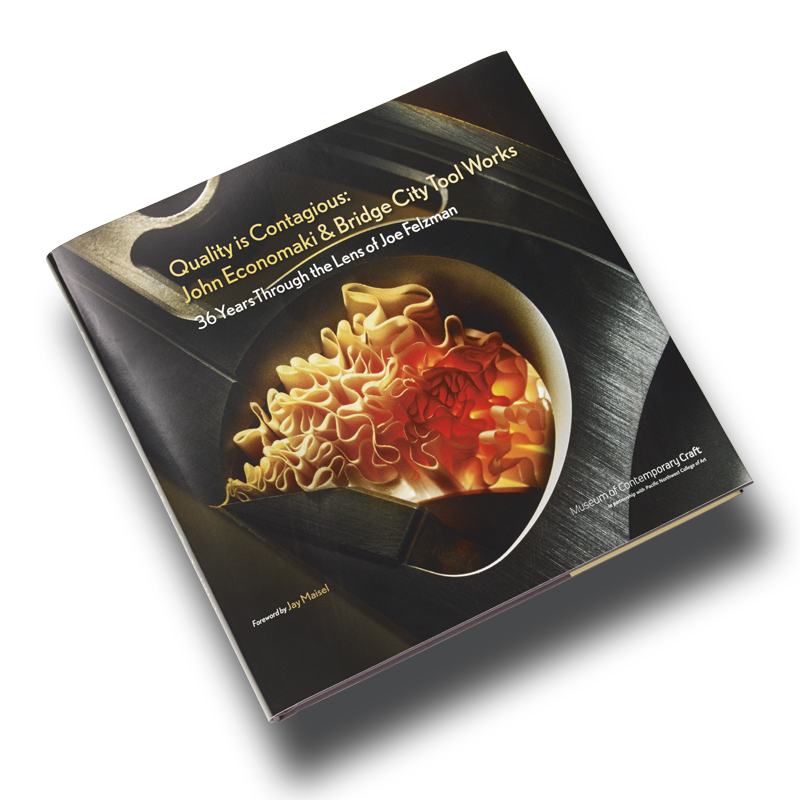 Alongside the exhibition, the book “Quality is Contagious: John Economaki & Bridge City Tool Works, 36 Years Through the Lens of Joe Felzman” will also be unveiled at the August 15th opening. We invite you to come to the Bridge City Showroom and Skunk Lab Open House from 10am to 3pm at our Portland headquarters. Non-alcoholic beverages, wine, and finger foods will be provided. At five in the evening, we are hosting a Book Party for our customers. This is a great opportunity to meet all those associated with the book and hang out with Joe Felzman. If you are interested in attending this function, kindly RSVP to Consuelo@BridgeCityTools.com for further details. From 10am to 6pm, we have arranged for a Wine Tasting Tour Through the Willamette Valley. We will visit 4 to 5 vineyards and tasting rooms. The first stop will be Chehalem Wines, where their Pinot Noir is extraordinary and their Inox Chardonnay is fantastic. If you have never been on a tour or would like to rediscover the beauty of the Oregon wine country with great company, please RSVP to Consuelo@BridgeCityTools.com . Cost will be at least $50 per person (final price TBA) and space is limited. Please be aware that the deadline to RSVP for both the Book Party and the Wine Tour is May 1, 2013. For those not interested in the wine tour, we suggest renting a car and driving east from Portland through the Columbia Gorge, turn right at Hood River and drive around Mt. Hood, stopping at Timberline Lodge for lunch, maybe ride the “Magic Mile” chair lift up to the snow fields (on a clear day you can see Mt. Shasta in California, about 400 miles away!) before heading back to Portland. To us locals, this is called the “loop trip” and it is jaw dropping. For accommodations, we recommend making hotel reservations with the Paramount Hotel. It is only a few years old, very nice, and affordable. From the airport, one can ride the MAX light rail and get within 2 blocks of this hotel. For those of you with female significant others, Nordstrom’s is only a block away. Why would we mention this? Oregon does not have any sales tax. Portland is only an hour away from both the Oregon Coast and Mt. Hood (you can snow ski in August here). The breathtaking Crater Lake National Park (pictured above) is a 5 hour drive from Portland. Seattle is a three-hour drive from Portland while Vancouver BC is about 5 hours. Other sites of interest include the World Forestry Center, tons of microbreweries, and our local food carts. There are lots of great restaurants in Portland to whett your appetite as well. If you are arriving the weekend before the exhibit launch, you can also check out The Bite of Oregon at the Waterfront Park in downtown Portland.